can’t post leeteuk’s birthday post on time. xcc too busy. but we’re celebrating it. ja! So I just made a twitter account. I thought that it would be really helpful for my dear wordpress blog. Since I always feel lazy to post a true blogpost, this twitter would actually be the source for updates. As you know, I am updated with my fandoms but it’s just that I don’t talk about them here in my blog. It takes a lot of effort to write a post. Hahahaha. :)) By just tweeting, I can actually tell the “readers” what I am fangirling about or what I saw or whatever. So wp will still be updated. But twitter makes me procrastinate. :)))) I was supposed to do a homework but I enjoyed tweeting about how I’m learning how to dance Replay. Ohyeah. > Learn to dance Replay. > Learn to dance Again & Again. > SJ and 2PM discography. > Catch up with everything about Kpop. > Catch up with SJ vids. Aaaaw, the 3rd album promotions are done. I would say that watching current perfs are just WAAAAY better than catching up or watching old vids. WHY ON EARTH I BECAME A SUJU FAN JUST NOW???? Ohwell, at least I saw almost all of their It’s You perfs and some Sorry Sorry. CATCH UP, CATCH UP! So BELATED HAPPY 21ST BIRTHDAY NIChKHUN! And BELATED HAPPY 27TH BIRTHDAY RAIN! Boys’ Generation. [YEY FOR HD!] HAHAHAHA. :))) This perf was really cool. And how good of Sungmin to still perform even though he injured his knee. The show must still go on even though he’s in that state. Oh Sungmin, what a pro you are. Key is just feminine. PERIOD. I mean Jo Kwon is such a girl-wannabe but he’s so funny and awesome and I just forget how gay he is in this. But Key, oh Key, I thought you won’t get to sing. But yey! I see that Key wears a different outfit from them, hmmm, why? And Hyukkiedeedoo’s rap is awesome! And LOL at Shindong’s hair! What’s with the weird parting? :))) I can’t believe Taec can actually look girly-ish, HAHAHAHA. I’m used to his fierce (or dorky) self so it was really kewl. 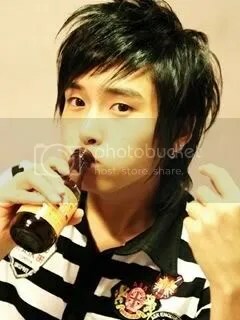 And Sungmin (again), he’s just meant to sing girl group’s songs. :)))) Jay looks awkward, idk and idgi, errr, it’s just that he’s just so manlyyyyy, yaknow. Yesung was his usual self, nothing changed except that he wore colorful skinny jeans. :))) Well, Khun looked like he’s the LA version of Goku in the American movie. Not an insult but I just noticed it. HEEHEE. I think he can be more girly if he wants to. :))) If you still don’t know, Sungmin had an injury the morning before this performance in Music Bank (during the rehearsal) so if you’ll see in the SJ – It’s You + Sorry Sorry perf, he’s just on the side. Yeah, aaaaawww. And Onew. We all know about his prior teeth incident before their comeback perf, right? And now, while performing, he slipped and was seen limping during encore. And then, a light fixture almost fell on him (fortunately, siwon and kyu were able to catch it) but they say that all the sensory overload made him faint. His manager piggybacked him and he was brought to the hospital. They said he’s already fine but I wish he’ll get more rest. Aaaaw, my dear tofu. XC Juliette perf + fancam of Onew being carried. :((( And the tribute to MJ. We are the Future. I didn’t mentioned 2NE1 but I watched their perfs. I’m not a FAN YET and I feel lazy after wibbling a number of words. :))) Yeah, excuses once again. So uhm, SHINee performed a short dance cover for Michael Jackson’s Heartbreaker as a tribute to the late King of Pop. 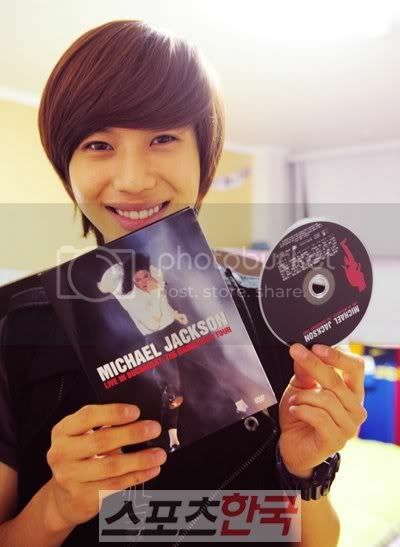 MJ has been an inspiration to some members of SHINee. Jonghyun‘s singing inspiration [ahem ahem LLO verse] [BTW, the link is to a clip of him in Star King imitating MJ], Taemin‘s dancing inspiration [the link is, just click it XD] and Onew‘s too [clip of Onew’s moonwalk and he even said in a magazine that he’s MJ]. The dance served as their intro to their Juliette Performance in Music Core. I can’t afford to freakin’ make this a birthday-picspam-pimp post since I am still not well-versed with Super Junior. Oh come on, I just turned over to the dark side late this May. =)))) A month hasn’t passed since I went gaga over them and slept at 4am because of them. So I didn’t have the time YET to save pics since I was busy-ing myself watching SJ vids – catching up what I was missing for the past 15 years of my life. Oops, I just blurted out my age but it has no relation to this post. Oh, how talkative I am. XDD So definitely no astonishing post that you’ll see here. But I just really want to do this so yes, I’m actually doing this and I’ve written a paragraph already to show my growing love for SuJu. Thus, this will be a birthday-pimp post, yey! So I shall stop my “defense” here since I know you’re just sick as I am with excuses. And as I watched more and MORE and MORE videos of SuJu, I knew that he’s not just a cute face but a wickedly talented young man. Being able to hit those high notes perfectly, his voice is just PRECIOUS. He’s one of the lead singers in SJ and I couldn’t agree more to how good he is. Not just that, but he loves composing music (and will stay up until he finishes it) and plays the piano really well. He’s a true musician. Oh dear, I am weak with musician guys. Oh goodness. What I like about him is that I can distinguish his voice immediately. I mean in a song ‘cause it’s so distinctive. Heehee. And his cheekbones, oh! My first vids of SJ are those of Full House. And Wookie is not there and when I see him sometimes, he looks so quiet. Or so I thought. But as I watch variety shows ahem referring to Come to Play ahem he’s also talkative. And other members said that he’s like an aunt. He cooks for them and he gets angry when they just eat whatever and don’t ask him to cook. Aaaaaawwww. He also prepares food for Donghae at 3am when Donghae has a schedule on 5am. More aaaaaaaaaaawwww. They said he’s a really good cook. Even his mum said that he didn’t joined SJ to be a maid. Heehee. :)) He washes strawberry for the members if they want blahblah. Such a sweetie. And I think he’s pretty handsome and attractive. I mean, maybe not Donghae or Kibum’s level, but I think he has definitely more face value compared to other members. But I love all of them. 😀 😀 He used to be chubby, but now, look at him, he’s so skinny. Arirang Showbiz Extra Ryeowook’s Monologue. I’m surprised that he has a high alcohol tolerance level since he’s so small! I mean, 4 bottles of soju is a lot, right? Relay talk Eng Subbed. Song Battle Cut Wookie. Pre-Debut. Dance Fail. Singing battle with Kyu. Acapella Marry U with Eunhyuk, Leeteuk and Shindong. Wookie with Kids. Wookie playing the piano (Super Mario). Singing Honesty on SJ Show. Still With. I Still Don’t Know. My Sadness only. Eud Deon Geu Ri Um. Love is Like Glass. Pa Bo (Fool). Kiss Goodbye. Just When I Needed You the Most. P.S. It took me a week to do this post. I’ve spent my time in front of the lappy researching and preparing this so give me some slack. I promise to be more animated in blogging so it would be more enjoyable to read this. And I promise to use a thesaurus so I won’t ran out of adjectives. P.S. version 2. Birthday/Pimp post done. Will now prepare for the July celebrants since there are too many. Teuk (SJ) on the 1st, Heechul (SJ) on the 10th and Taemin (SHINee) on the 18th. Then I’ll get to breathe before the birthdays in August. OMG, I almost ended this post without greeting Wookie. My dear, dear Wookie, Happy Happy Birthday to you! I wish you more cuteness and may you be able to compose more. Don’t stress yourself too much, take time to eat. Okay, I’ll stop here since I sound as if I’m his mother. I promise you that I won’t leave SJ and I’ll get to know you more. I haven’t updated about my personal life for a while. Well, as if someone will care. So just so you know, I’ve started attending university. First week as a freshie was so tiring. With all the rain and not having an umbrella when it rained the most, it was really grueling. Transferring to and from classes is tiring too. I need a thesaurus. Rawr. And as of now, I’m still commuting. I’ll be living in a boarding house soon and that will make updates less frequent. Aaaaww. just telling you so you won’t expect posts that much. 🙂 Wish me luck in my first year in uni. But I’ll still be updated with my fandoms, it’s just that, I won’t be able to post them here and I won’t be able to watch dramas that much. Except for weekends which lasts for three days. Whew. I promised this blog that I’ll treat it well from now on. So here. A clip with Leeteuk, Kang In, Ryeowook and Eunhyuk from Super Junior. XD With subs! I know you want to watch it now! Thanks to spazzishazzii@wp for the info! And thanks to sok663@yt for uploading! I just realized that if, just if, I posted updates about my Korean Music Fandom and every fangirling activities I’m doing, then this blog could be a lot more interesting. Full of videos and updates and all. *blames self* Why am I such a lazy person that I can’t even update my dear blog? Don’t I realize that by writing in English I’m actually training myself in English? Rawr. So I’m posting my To-Do for this blog. Write reviews for everything that you’ve watched. (Uh-uh, this would be really hard considering that I actually can’t remember everything that I’ve watched. Introduce your fandoms. (No one will follow this if they do not know who and what I like.) Ahem ahem write pimp posts! And a whole lot more of tasks. Will edit this if I remember other tasks. Woohoo. So that’s all for the mini-declaration that I have a longer vacation. Yokatta!